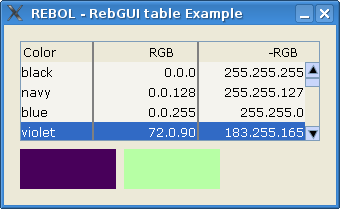 rebgui-table.r is an introduction to the ease of gui creation with RebGUI. This script is an introduction to the display function and table widget of RebGUI. The keyword on-click is not really necessary, the first action block of a RebGUI widget is the on-click action. 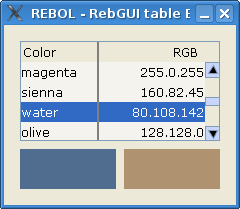 set-color is a RebGUI support function for controlling colors of many RebGUI widgets. For early experiments with your local copy, try adding a column, perhaps the inverted color value. and then update the options block for the table headers. In the action block, pick the third item to change the bbox color, instead of recalculating. The table was made a little bigger, and the percentages for the columns were also changed, just for the looks. Well, REBOL/Core will not have the capabilities to run RebGUI, You will need to start up REBOL/View.